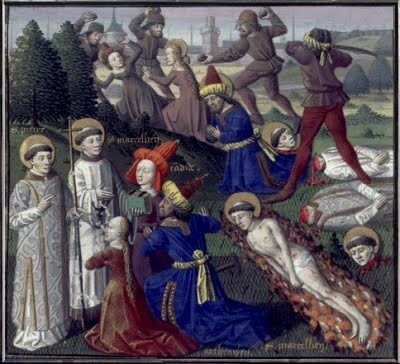 June 2 - Saints Marcellinus and Peter, Martyrs - Optional Memorial - My Catholic Life! Saint Helen went to the Holy Land and returned to Rome with remnants of the true cross of Christ. This same Helen was the mother of Constantine, the Roman Emperor who legalized Christianity in 313 and who called the Council of Nicea in 325. When Saint Helen died about 328, her Emperor-Son placed her body in a monumental, sumptuous, sarcophagus of rare, porphyry marble from Egypt. The deeply carved red stone shows Roman soldiers on horseback conquering barbarians. These are not scenes likely to adorn a pious woman’s tomb. It was probably meant to be Constantine’s own sarcophagus, but when his mother died, he used it for her. And Constantine did one more thing for his mother. He built a large church on the outskirts of Rome over the catacombs, or burial place, of today’s saints, Marcellinus and Peter, and placed his mother and her tomb inside of the church. That one so famous and powerful as Constantine would build a church over the catacombs of Marcellinus and Peter, and honor this church still more with his mother’s tomb, testifies to these martyrs’ importance to the early Christians of Rome. And since they were martyred about 304, only a decade before Constantine conquered the eternal city, their memory must have been fresh. Until this time, Christians worshipped in dark, hidden places. As they first stepped into the public light to build the ancient churches whose walls, pillars, and foundations can still be visited today in Rome, these Christians honored those who came before them. They honored those whose deaths were all the sadder because they perished so close to the day of Christian liberation. They honored Saints Marcellinus and Peter. Little is known with certainty about Saint Marcellinus and Saint Peter. Tradition tells us that Marcellinus was a priest and Peter an exorcist. They were important enough to be included in the official list of Roman martyrs and to have their names remembered in the liturgy of Rome. As this Mass became standard throughout the Catholic world, the names of Marcellinus and Peter were embedded into the Roman Canon, the First Eucharistic Prayer. And there they are read at Mass until today, more than one thousand seven hundred years after they died. The Body of Christ forgets nothing, retains everything, and purifies its memory to honor those who deserve honoring. A few years after the bloody event, a little boy from Rome heard about the deaths of Marcellinus and Peter from the mouth of their very executioner, who later became a Christian. That little boy was named Damasus and he went on to became Pope, from 366-384. Remembering the story he had heard as a child, Pope Damasus honored Marcellinus and Peter by visiting the catacombs below their church and adorned their tomb with a marble inscription recounting the details of their deaths as he had been told them so long ago. Unfortunately, the inscription is lost. The circumstances of their deaths were likely similar to those surrounding other better documented martyrdoms: some public declaration of faith, arrest, perfunctory trial, a chance to offer sacrifice to a Roman god, a refusal, a last chance to be an idolater, a last refusal, and then a quick, businesslike beheading. It was over quickly. Then came the calm. Then came the night. And out of that darkness a candle lit procession emerged of humble Christians walking in utter silence toward the place of execution. The headless corpses were placed in white sheets and carried with all solemnity to an underground burial niche. A small marble plaque etched with the martyrs’ names was placed nearby. An oil lamp was lit and left burning. Thus the veneration began. Thus it continues today. The catacombs and the first Basilica of Marcellinus and Peter fell into ruins at the hands of two enemies—time and the Goths. But both are archaeological sites and can be visited. A “new” church was built near the original and still operates as a parish. Saint Helen’s bones were removed from her imperial tomb in the twelfth century and were replaced with the body of a Pope. The tomb was emptied again later and, in 1777, moved to the Vatican museums. Hundreds of thousands of tourists walk right by it every year, seeing perhaps just a huge chunk of marble, oblivious to the rich history connecting the tomb to ancient Christianity and the martyrs we commemorate today. Saints Marcellinus and Peter, help all those who seek your intercession to face persecution and intimidation of any kind, via words, or arms, or threats, with bravery and heroic resistance. St. Marcellinus succeeded St. Coins in the bishopric of Rome in 296, about the time that Diocletian set himself up for a deity, and impiously claimed divine honors. In those stormy times of persecution Marcellinus acquired great glory. He sat in St. Peter’s chair eight years, three months, and twenty-five days, dying in 304, a year after the cruel persecution broke out, in which he gained much honor. He has been styled a martyr, though his blood was not shed in the cause of religion.